As has been documented elsewhere, despite the FEI short term suspension of the UAE in order for them to clean up their act, nothing has radically changed. At least 5 deaths so far this year. No information forthcoming on what happened to horses attributed the generic FTC, or horses that didn’t reach vet gates and are down as RET, or more remarkably horses that have sustained a catastrophic injury (CI) and magically not been euthanased? Even taking into account the horses whose exits are documented clearly in the results, many of those are out lame by the second vet gate. The appalling completion rates, 40kmph average speeds on loops in 160km races, footage of illegal practices such as ear twitching in vet gates and the somewhat bizarre belief that horses don’t need to drink on track if they’re sloshed with water indicates the welfare issues are still very significant. There is one lone participant, Dr. Sheikh Sultan, who is attempting to use his influence and facilities to alter the status quo. A top class article by Pippa Cuckson details the situation HERE. 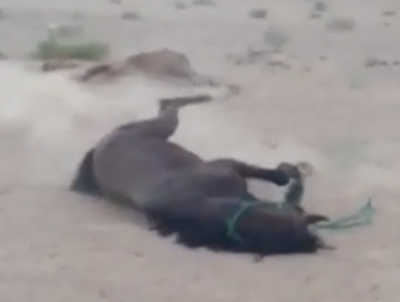 Social media has been used to highlight the cruelty in the UAE, and there has been a strong push to inform those still selling to Group VII countries of the horrors awaiting horses sent over there. As ever, there are those that prize the dollar and self-interest over the horse as a sentient being. The big sellers suggest that those highlighting the abuse are somehow determined to destroy the sport of Endurance by creating divisive feeling within the sport. One very interesting diatribe by someone who sells a lot to the UAE concentrated entirely on how much this person and family enjoyed endurance, how selling abroad allowed them to continue and how wonderful the sport was. Not only is that entirely missing the point of endurance being at heart about partnership of rider and horse, but there is no real understanding of the sport’s financial dynamic as a result of selling the good horses abroad. Any equestrian sport wishing to be healthy nationally, and successful globally, has to keep it’s best horses within the country’s NF. This encourages flourishing competition and attracts sponsorship to grow the sport and support the grass roots whilst giving young riders something to aim for. If top horses continually leave a country, competition becomes poor, interest will wane and the sport will deteriorate. That has been proven in other countries, in other equestrian sports. Those defending selling tell stories of how wonderfully the horses are all looked after once in the Group VII countries, the amazing stables and facilities, the love the Arabs have for the horses and all the other guilt appeasing bullwarp. Never mind the videos that are available of maimed and dying horses, or the practice of leaving horses to simply die in the desert when they have no further use for them. There is no answer given when asked what has happened to the horses that no longer run. 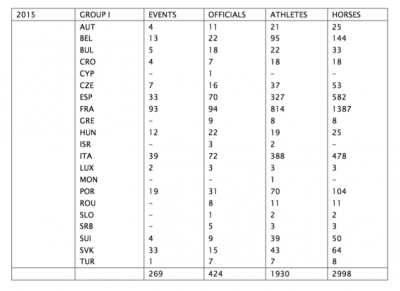 A study of the statistics on the FEI database throws up some staggering figures. 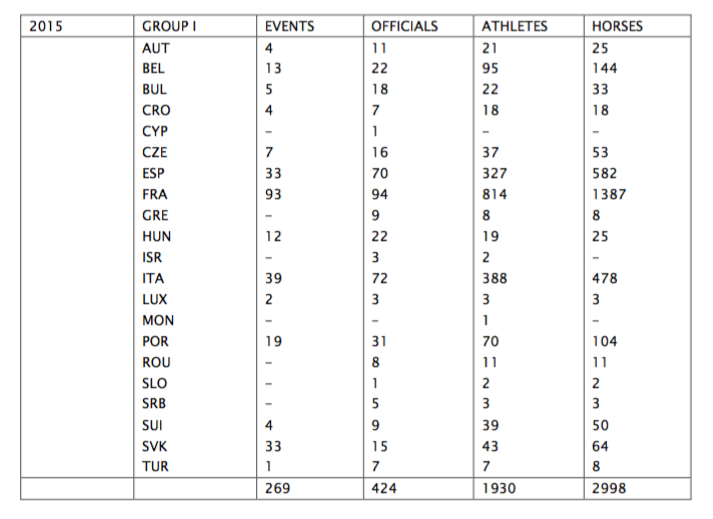 Using 2015 for completed statistics, see below the tables for each country. 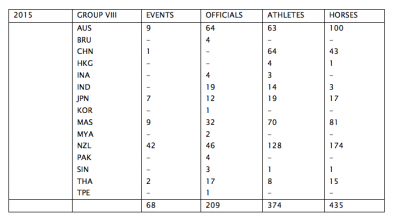 Group I countries, the average ratio of horses to riders is 15 horses to 10 riders. Group II countries, the average ratio of horses to riders is 13 horses to 10 riders. Group III countries, the average ratio of horses to riders is 10 horses to 10 riders. Group IV countries, the average ratio of horses to riders is 13 horses to 10 riders. Group V countries, the average ratio of horses to riders is 10 horses to 10 riders. Group VI countries, the average ratio of horses to riders is 12 horses to 10 riders. 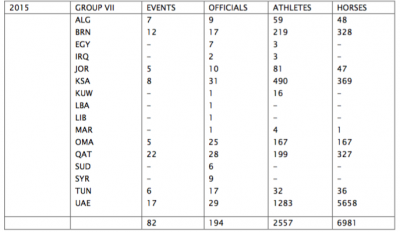 Group VIII countries, the average ratio of horses to riders is 12 horses to 10 riders. Group IX countries, the average ratio of horses to riders is 14 horses to 10 riders. 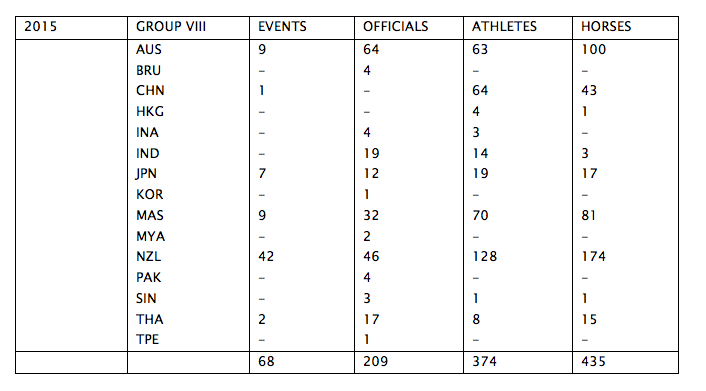 There’s a reason Group VII has been left to last with the average ratio of horses to riders is 27 horses to 10 riders. Looking more closely at that, the UAE has a whopping 44 horses to 10 riders, which seems to fly in the face of the partnership notion, given the use of jockeys for many of the Sheik owned horses. In the Group VII countries, the least horse friendly given the intense desert heat and lack of natural vegetation, there are 6981 horses in Endurance, more than double than anywhere else in the world. Only in mainland Europe does Group I comes anywhere close with 2998 horses. As French Endurance outfits breed for the Sheiks who have competition stables there, it’s no surprise that 1387 of the Group I horses are French registered. Even taking into consideration that there is more money in Group VII, and that the Sheiks can afford more horses and so on, the question rather worryingly begs itself, WHY do they need so many? Another look at the tables has thrown up an even more interesting statistic. Taking as an assumption horses compete several times a year and mostly in their own countries, the breakdown of horses to events being under 10 per event makes sense for horses that run throughout a season. 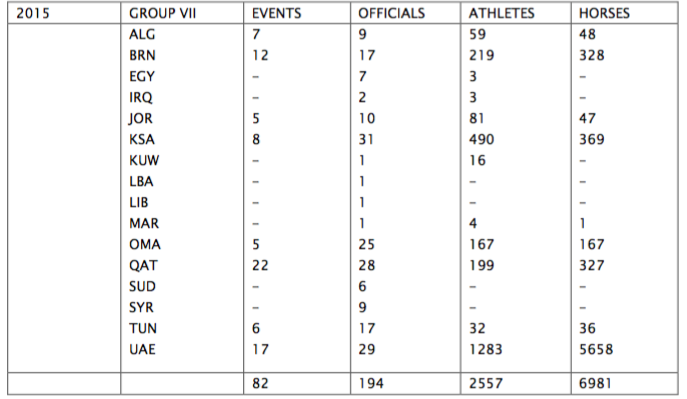 Then there’s the Group VII figures, of 85 horses per event. Then looking closer, there’s the UAE figures of 332 horses per event. Despite accepting that clearly horses travel outside their own countries to run, these figures suggest horrendous attrition rates. What happens to these horses? Where are they all? So this is to breeders who have sold without qualms or regret, or are considering selling to the UAE; perhaps you ought to pull the wool from your eyes and look at these stats. These are horses. Sentient beings, that you bred. If, as breeders, you cannot see the significance of the stats, or are blinded by the Arab dollar, then shame on you. Those of us fighting for change should not need to be the ones having a conscience for those horses.